Hi All, With current foreign affairs talking about Fidel Castro and Cuba, I updated my previous post on Fidel (4/23/2007). I added a commentary, some HTML links and a 1968 documentary video. I encourage those with open minds to read and watch, listen and think. Thanks!!! Best wishes to all -- for the coming new year 2015. To health and contentment. Firstly, I became a fan of Fidel when i was in college and having read his book "History will Absolve Me." ( or some excerpts here).The book was published here in the USA during the 1960s. Note that he was a student of the Jesuits' school in Havana. A son of a small hacendero but in the elite milieu, he was a student activist, then a lawyer, became a socialist, led a rebellion which failed, was jailed where he delivered his speech that became that book (reminds me of Marcos but who was indicted for murdering his dad's political opponent - Nalundasan using a UP ROTC rifle). Coincidentally too, I was a fan of the Kennedys. JFK and RFK. But just 2 months ago, I picked up a recent book about the history of the CIA, written by a Pulitzer Prize awardee Tim Weiner, all based on primary sources "LEGACIES OF ASHES." It showed that JFK okayed the assassination of Ngo Dinh Diem, a US-educated Catholic and handpicked by the USA to be President of South Vietnam. Diem was terminated by Vietnamese military/generals who at the time insisted they will do so whether the US give approval or not. As to RFK, for 3 years, he wanted the CIA to assassinate Castro and they tried and failed several times in various ways. RFK was the Attorney General but was actively running the CIA. For some reason, the Kennedy brothers did not like Castro. You see to understand present events, we have to seriously study the past. Not just watch current news, especially on TV or even printed press. the Associated Press practically control foreign news having bought most of the rest. It's an oligopoly at best despite the appearances of many independent news reports/sources. Like your sunglasses where 80+% come from only one company owning various famous or well-known marketers. Going back to Cuba, when Castro with Che Guevara defeated the US-supported dictator Fulgencio Batista, he went to the USA, addressed the UN, and was accepted. But when he demanded better deal for Cuban sugar, the Americans balked. And Cuab is practically a one-product country, i.e. sugar. So Castro nationalized the sugar industry and the sugar mills/refineries owned by Americans. The US imposed embargo and the Castro government has to accept the only willing buyer at world prices, i.e. the Russians. remember the Cold War. And so, the economic embargo by US and allies continued to this day. Meaning, not much goods available to the Cubans in the islands. Then Russian communism disintegrated and Cuba lost its main supporter. And so things got worst, economically speaking. Why is US so brutally harsh to CUba? Because it considers the whole of South America its backyard, remember the Monroe Doctrine and the Roosevelt Corollary? Despite all these hardships, the Castro regime has fostered strong Cuban nationalism, heightened mass literacy, recognized by the WHO as one of the best in free/universal healthcare and produce the most number of doctors, many of whom are sent to help other poor countries (not Cuban soldiers as during the 1970s-1980s). Sure they do not have the goodies we have here in the "free world" or even in our homeland where majority of us natives are outside looking in, content with imported fakes. Maybe their groceries and stores are empty, as we are shown by US media. But I haven't heard or read of Cubans starving or thousands dying each year due to the tens of hurricanes that annually visit the islands. The Cubans have one of the United Nations (world) recognized, best preventive-emergency plans for such natural disasters implemented and educated about from Grade School and on. How about us, in our homeland? Do our politicians, business leaders and so-called leaders care? maybe for photo-ops, which we are sampled each time a disaster strikes. I believe and think those Cubans in Cuba are strongly nationalists. They have a knowledge of their history given the strong drive for the mass education. Their new generations will be nationalistic regardless of the form of economic system they end up with. With Cuban nationalism, freed from US-imposed hardships via economic embargo, will be economically successful in its dealings with the world, and such will cascade down to its people. I personally feel and believe that nationalism is the sine qua non to native progress under whichever/any economic system. Of course, just like anytime, the US and its capitalist partners will proclaim capitalism won. But that's as shallow as Ronald Reagan or Bush II were in declaring they defeated communism or mission accomplished. Furthermore, remember real enemies of the USA like Vietnam, China, to cite a couple are still officially communist countries where thousands of Americans have died and suffered casualties and the USA heavily trades with them. Fidel Castro's Cuba has has not fought or killed Americans in any comparable war, but for the past 50+ years, has been under US economic embargo. Extremely unreasonable for the USA, which keeps on blaming Cuban revolutionary leaders as the cause of economic hardship. The USA hates and gives hell to Cuba and the Cuban people because the latter would not bow and knell down to the USA, as most Latin American countries (and our homeland Philippines) do. Russian Communism failed because true Marxism was not practiced by the leadership. It became rule by a Party, the Politburo. An exclusive membership. Capitalism failed, still unrecognized, in the Philippines because it is ruled by oligarchs, by a few landlords in cohorts with foreigners, unknown or misled by the concerted efforts by these same class/socioeconomic and political elites, supported by a JUSMAG-controlled military leadership, to impose, control and maintain mass ignorance of history. We ask and limit our questions based on what we see on western-controlled TV at home and abroad. That makes it so different when we sit down to read books, though boring and demands deep thought, but we have to read to really understand and read opposing positions if we want to seek the truth, As the cliche goes. At the end of the day, communism (not to be equated or confused with socialism as practiced in Scandinavia, especially Norway) will fail because it limits inherent human desire to be free, in the best interpretations we can think of; not just free to shop and drop. But as the great Nelson mandela said, who was incarcerated for 25 tears by the racist.apartheid regime of South Africa, communism is useful. And I think for a young country which has not successfully established itself as a strong state rather than a weak state like ours), I agree with Mandela. However, given our fanatical religiosity, I doubt if it can flourish in our homeland as an ideology. If true agrarian reform, decades promised and whitewashed, emasculated and unimplemented, will go a long way towards progress. 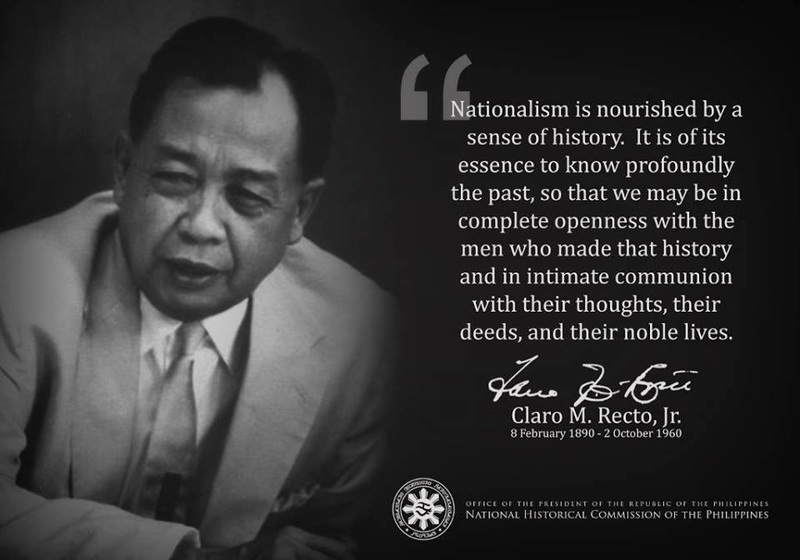 Without Filipino nationalism, we will continue in our slide to perpetual perdition. And given the attitude of our only hope, the educated, I am not optimistic. PS: Watch a documentary video about Fidel Castro and Cuba produced by the late Saul Landau (1968); just 8 years after the Fidel, Che Guevara and their fellow revolutionary defeated the US-supported Cuban dictator Fulgencio Batista. Watch, listen and think. To do justice to my honorary title of Professor Emeritus, I have volunteered to give lectures and hold seminars in the various campuses of the UP System. This lecture is in partial fulfillment of my self-imposed obligation. It also has another purpose. All over the world the friends of Cuba are celebrating the 80th birthday of Dr. Fidel Castro on August 13, 2006. This is a contribution of Phil-Cuba (or the Philippines-Cuba Cultural and Friendship Association) to this worldwide celebration. Phil-Cuba chose this day, July 26, for its historic significance. Exactly 53 years ago a band of amateur soldiers stormed the arsenal of the Moncada barracks in Santiago de Cuba to collect weapons for the guerrilla war against the dictator Fulgencio Batista. In a sense the attack was a failure; many participants perished and the rest were captured, including Fidel Castro. But in another sense it was a monumental success because it roused the nation and set in motion the process of system change. Although our two countries are half the globe apart, our histories ran along parallel lines. They diverged only in 1959, when Cuba moved ahead to build socialism, while the Philippines sank deeper in the mire of neocolonial capitalism. What happened after that turning point should make us reflect on the basic assumption of our foreign policy. Our leaders have always taken it for granted that a small underdeveloped nation cannot stand up to the United States; therefore we have no option but a foreign policy of mendicancy and subservience. The Cubans dared to take the path of defiance and survived 47 years of extreme pressures: economic blockade, military invasion, diplomatic pressures, and terrorist attacks. Not only have they survived, they have also built a new social order, a shining alternative for the Third World. This lecture tries to explain why and how they did it. As backgrounder, let us review the histories of Cuba and the Philippines. Christopher Columbus arrived in Cuba in 1492, twenty-nine years before Ferdinand Magellan landed in Cebu. Spanish rule in both countries ended at the same time, in 1898, when Cuba and the Philippines were ceded to the US in the same Treaty of Paris, for the bargain price of $20 million. In 1762, the British grabbed the Philippines and Cuba, and occupied the Philippines for two years and Cuba for nine months. Although brief, the British interregnum opened our windows to the world outside the cloistered walls of the Spanish empire. Like a mummy exposed to fresh air, the Spanish colonial system began to disintegrate. The Cubans started their fight for independence in the 1868, four years before the Cavite mutiny. Their struggle peaked in the mid-1890s, around the time Andres Bonifacio raised the banner of revolt. Both ventures ended in tragedy. US imperialism replaced the moribund Spanish empire. While the Americans kept the Philippines for half a century, they kept Cuba only for a few years. Cuba received its independence in 1902. But in granting independence to Cuba the US Congress inserted into the equivalent to our Tydings-McDuffie Act the infamous Platt Amendment. This authorized the US to intervene should the puppet government in Cuba fail to protect American interests. To facilitate the intervention, the US obliged Cuba to host a military base, just as the US did to the Philippines in 1946. To this day the US base in Guantanamo exists, notwithstanding an eviction order from the Cuban government. Recently it served as a torture chamber for Taliban prisoners from Afghanistan. The US made a mockery of Cuba’s independence by invoking the Platt Amendment three times. In 1906-1909, in 1912, and again in 1917-1923, US troops invaded Cuba to install a more congenial puppet. From the 1902 to 1958, a series of corrupt pro-American governments acceded to power in Havana through fraudulent elections, in the style of Gloria Macapagal Arroyo. Although submissive to the US, their corruption, incompetence and repressiveness provoked popular upheavals that imperiled American business. These provided the excuse for interventions. Like our trapos, Cuban politicians assumed a nationalist posture during elections, but once elected, they readily yielded to American bribery and coercion. Bribery and coercion proved so effective that the US eventually found direct intervention unnecessary to keep Cuba under control. The Platt Amendment was therefore repealed in 1933, but American meddling continued unabated. The US molded the Cuban and the Philippine economies to resemble each other. Both were dependent on a single crop (sugar) and a single market (the US). Until Fidel Castro broke this pattern in 1959, the powerful sugar blocs in the Philippines and Cuba competed with each other for the American sugar quota. Having retraced in desperate brevity the histories of the Philippines and Cuba, I will now examine the beginning of Cuba’s turbulent relations with its powerful neighbor. I will try to show how Fidel Castro, after successfully using guerrilla tactics to beat Batista, used them also to parry the blows of US imperialism. Guerrilla tactics are a weapon of the weak whose basic principle is to generate popular support in order to transform the enemy’s overwhelming strength against itself. The policy makers in Washington backed Batista to the bitter end, just as they would back Marcos until his position became untenable. Yet they were not unduly alarmed when the bearded rebels marched into Havana in January 1959 because they expected Fidel Castro to be like the previous Cuban rulers — easy to corrupt and coerce. They realized their mistake too late, when national amor propio was already involved and the damage had become irreparable. Fidel Castro stood by his commitment to the people, especially the peasants who supported his guerrilla army — July 26th Movement— in Sierra Maestra. Having promised them agrarian reform in the first year of victory, he appointed Che Guevara to craft an agrarian reform program. Initially the program was moderate, compared to Cory Aquino’s CARP. Only landholdings in excess of 400 hectares were subject to reform. The American landowners were willing to accept that limit. What bogged down the negotiation was the issue of compensation. The Cubans calculated the price on the basis of the last tax declarations. Since the landlords in Cuba (as in ours) had undervalued their assets to evade taxes, they could not agree to this proposal. Also unacceptable was Cuba’s offer to pay in long-term bonds. The American landowners wanted immediate cash payment, at a price they dictated. The Cubans were open to compromise on this issue, but the Americans dragged their feet at the bargaining table, presuming that at the right moment they could break Cuban intransigence with an offer of economic aid. They had employed this trick before, and the previous Cuban governments always buckled down. To their surprise, Cuba promulgated an agrarian reform law while the negotiation was ongoing. Fidel assured the American landowners that the negotiation would continue, but the peasants could not wait since he had promised them lands in the first year of revolution. This irked President Dwight Eisenhower. Near the end of his term, Eisenhower ordered the CIA to prepare plans for getting rid of Castro. But for Cuba the future after Eisenhower looked bleaked. The protagonists in the 1960 presidential election — John Kennedy and Richard Nixon — tried to outdo each other in Castro bashing. In the past, the mere threat of a cut in the sugar quota sufficed to force a recalcitrant Cuban government to capitulate. But Kennedy (just sworn in as President) did not even issue a threat. He unilaterally cancelled the Cuban sugar quota after the milling of that year’s harvest. Because of geographic proximity to its single market, Cuba never built silo barns for storing their refined sugar. It was therefore urgent and imperative to dispose of their sugar before the rainy season, otherwise they would lose everything. Kennedy reckoned that his unilateral action would force Castro to concede. But rather than yield to Kennedy’s diktat, Castro looked for another buyer. It was then that he approached the Soviet Union. Sensing a chance to rile the Americans, Nikita Khrushchev agreed to buy the entire Cuban harvest at a price higher than what the Americans would have paid. The deal was too good to be true. But there was a catch: the Soviet Union would pay in crude oil, not in cash. This triggered an exchange of blows that culminated in the total rupture of US-Cuban relations. When the Soviet tankers arrived in Havana, the American-owned refineries refused to process Russian crude oil. Fidel ordered the army, backed by mass demonstrations, to take over the refineries. Kennedy’s response was quick and decisive. He broke off diplomatic ties with Cuba. Castro was no less quick and decisive. Anticipating a massive flight of capital, he sequestered all American banks and other American assets in Cuba. The proud Kennedy could not take this sitting down. He assigned a CIA agent named Richard Bissell to execute an oust Castro plan. Bissell was the same CIA agent who in 1954 plotted the overthrow of President Jacobo Arbenz of Guatemala; Kennedy thought he could do a repeat performance in Cuba. Early in 1961 Bissell assembled an army of Cuban exiles, mostly ex-soldiers of Batista. After hasty combat training in Bissell’s old stumping ground in Guatemala, the mercenaries landed in the Bay of Pigs on April 15, 1961. The Bay of Pigs was chosen because the CIA had information that the peasants in the area were discontented and would rally to the stars and stripes. Things did not turn out that way. Instead of welcoming the mercenaries, the peasant militias put up a stiff resistance until the regular army, veterans of Sierra Maestra, arrived to deal the final blow. The Bay of Pigs expedition collapsed in 72 hours. Furious, Kennedy replaced Bissell with Col. Edward Landsdale another instance when the histories of Cuba and the Philippines crossed. Lansdale was the military adviser of Ramon Magsaysay who is credited for crushing the Huk rebellion in Luzon. Lansdale recruited the Mafia to assassinate Fidel Castro. These gangsters had an axe to grind. Before the revolution Havana was their paradise. Mayer Lansky and Frank Costelo used to spend their winter holidays there. They owned the big hotels and controlled gambling, drug trafficking and prostitution. But upon seizing power, Castro kicked them out, disabled their crime network and confiscated their properties. Lansdale therefore considered them a dependable ally, but their gunmen bungled the hit job. Lansdale then activated his contingency plan: a second invasion around October 1963. In addition to Cuban exiles (mostly Batistianos), he hired soldiers of fortune from other Latin American countries. This time they went through intensive counter-insurgency training in Louisiana under Col. Napoleon Valeriano, a Filipino military officer who fled to the US after eloping with the wife of an Araneta. As commander of the dreaded Nenita Unit Valeriano was the precursor of Maj.-Gen. Jovito Palparan as the butcher of Central Luzon. A government-in-exile was set up in Miami to take over from Castro. Faced with a grave security threat, the Cuban government had to take a drastic counter-measure. Raul Castro — Fidel’s younger brother and commander of the Cuban army — rushed to Moscow to propose a treaty declaring that the Soviet Union regards an attack on Cuba as an attack on itself. Khrushchev offered a more daring proposal: the Soviet Union would install a missile base in Cuba. But there was something odd about this plan. A missile base is always built in utmost secrecy, but in Cuba the Soviets built the base in an open field, visible to U-2 spy planes. My theory, although never confirmed, is that the missile site was meant to be discovered. Khrushchev just wanted to convey the message that the Soviet Union would risk a nuclear war in defense of Cuba. Kennedy showed aerial photographs of the missile site to the UN General Assembly. Instead of denying the charge, Khrushchev announced that Soviet ships carrying additional equipment for the missile base were about to leave the port of Odessa en route to Cuba. Kennedy drew a line on the map and threatened to destroy the Soviet ships the moment they crossed the line. Khrushchev responded with the warning that nuclear warheads would start flying towards the major American cities should the US harm any Soviet ship. The world stood in fright as the Soviet military vessels sailed to the point where Kennedy said they would be destroyed. Bertrand Russell the British philosopher, wrote frantic notes to Kennedy and Khrushchev pleading for them to stop their dangerous game. Khrushchev replied that he would recall the ships if Kennedy would promise to disband Valeriano’s training camp in Louisiana, repudiate the Cuban government-in-exile, and dismantle the US nuclear bases in Turkey. When Kennedy complied, the Soviet ships turned back. It was a rare instance in history when a private person engaged in unofficial diplomacy and actually succeeded in averting a clash between the two superpowers. The predominant opinion is that Kennedy won the battle of nerves because he stopped the installation of a Soviet missile base so close to its territory. But if we recall that the primary reason for putting the base there was to abort the second invasion, it was a victory for Cuba. Most analysts overlook the missed opportunity to drive a wedge between Cuba and the Soviet Union as a result of the missile crisis. Castro got very mad at Khrushchev for involving Cuba in a deal without consulting him, thus making him look like a pawn. Unlike the docile vassals in Eastern Europe, Castro openly rebuked the Soviet leader. He expressed his outrage in several interviews with foreign correspondents, stressing that Cuba would never be anyone’s satellite. Kennedy could have exploited this to wean Castro from Khrushchev, but it appeared that Castro had become America’s number one enemy and his ouster was the highest priority objective. Khrushchev’s reaction was not typical of Soviet arrogance. Instead of hitting back, he invited Castro for a state visit. Castro agreed on condition that he could stay for a month to visit the other Soviet cities. The idea must have seemed preposterous to the protocol-conscious Kremlin bureau-crats. Nonetheless, Khrushchev granted Castro’s wish. In four weeks Castro went around the Soviet Union like an American presidential candidate on a whistle stop campaign. And everywhere the Soviet people welcomed him like a conquering hero. It took a while for foreign observers to discern Castro’s game plan. Taking advantage of his personal charm and heroic image, he sought to drum up the support of the Soviet people so that Cuba’s future would be less dependent on the whims of the Kremlin. In other words, he wanted to build up a constituency within the Soviet Union so that the Soviet people would spontaneously, not in a contrived way, come to the defense of Cuba in the event of another US aggression. I don’t know if Castro took the gamble because he was aware that at that point Khrushchev stood on shaky grounds. He was facing a grave challenge within the Soviet communist party. In fact, he was deposed after Castro’s visit and the new leadership under Leonid Brezhnev was even more accommodating, treating Cuba with utmost respect. For Castro, diplomacy is not simply relating with rulers; he also courted their citizens. If I may cite an earlier example of his unorthodox diplomacy, during his visit to New York in 1960, when he addressed the UN General Assembly for the first and only time, Eisenhower snubbed him. Thereupon he camped out in Harlem where he was warmly welcomed by the black Americans. At the height of the civil rights movement, this gesture endeared him to the militants. He used these tactics again when Kennedy sponsored Cuba’s expulsion from the Organization of American States (OAS). The US resolution won by a slight margin, with the major countries (Canada and Mexico) voting against. Since the OAS was already a moribund regional alliance, the expulsion proved to be a Pyrrhic victory for the US. Realizing this, Kennedy had to create a new organization of subservient states — the Alliance for Progress —by offering increased economic aid to Latin American states that broke ties with Cuba. In response, Fidel convened a conference of revolutionary groups in Latin America. Shorn of rhetoric, the 2nd Havana Declaration was an outright call for armed struggle against reactionary governments that participated in the US effort to isolate Cuba. A special unit headed by the enigmatic Manuel Pineiro, popularly known Barbarroja or Red Beard, trained guerrilla fighters from other countries of Latin America and Africa. Where circumstances permitted, Castro Cuban soldiers to fight in foreign lands. Moscow was unenthusiastic, but Brezhnev dared not repeat Khrushchev’s mistake of antagonizing Fidel. Grudgingly, the Soviet Union provided logistical support for Cuban interventions in Africa. It was Che Guevara who articulated Cuba’s strategy in his famous letter to the Tri-continental Congress in 1966. The best support the peoples of the world could give the heroic Vietnamese people, Che wrote, is to create two, three or more Vietnams. In other words, confront US imperialism everywhere in order to ease the pressure on Vietnam. After the MPLA drove the Portuguese out of Angola, the CIA armed and funded the counter-revolutionary group UNITA. When UNITA was about to be decimated, the apartheid regime of South Africa sent its elite troops into Angola to rescue the beleaguered UNITA mercenaries. With the white South Africans directly involved, UNITA suddenly became a serious threat that MPLA government could not handle alone. The Angolan president pleaded for external help. Castro responded by sending Cuban troops, invoking the principle of proletarian internationalism. In the decisive battle in Cuito Cuanavale, the Cubans broke the backbone of the South African army. The white South Africans withdrew from Angola mortally wounded, having lost so many of their best soldiers. This weakened the apartheid regime, making it vulnerable to the indigenous forces of the African National Congress. Shortly thereafter the apartheid regime released Nelson Mandela from jail. In the first multiracial elections, Mandela became the first black President of the South African republic. One of Mandela’s first acts was to visit Havana to personally thank Fidel Castro. In other places, however, Cuba’s internationalist project failed. Fabricio Ojeda was killed in Venezuela, although his legacy survived. Today this finds expression in the Bolivarian government of President Hugo Chavez. In Bolivia, Che Guevara lost his life fighting the military dictatorship. But there, too, his legacy survived and his memory is now enshrined in the Leftwing government of President Evo Morales. What is remarkable about recent trends in Latin America is that the Left forces are winning through elections, the arena where the Americans thought their puppets were unbeatable. When Yuri Andropov replaced Brezhnev in 1982 his primary concern was to resuscitate the flagging Soviet economy. He informed Castro that the Soviet Union would reduce military aid. Without Soviet logistical support, Castro was forced to recall the Cuban troops in Africa. Unwilling to abandon its internationalist foreign policy, Cuba started exporting doctors and teachers instead. This was unthinkable before the revolution, when 60 percent of the Cuban people were illiterate. C. Wright Mills, the distinguished American sociologist, noted an acute shortage of educated personnel in Cuba and cited this as the greatest obstacle to the revolution. At that time there were indeed very few Cuban professionals, and most of them worked for the American companies in Cuba. When relations with the US worsened, most of them fled. In 1959 there were only 6,000 medical doctors in the whole of Cuba; by 1962 some 4,000 of them had left the country. This could have engendered a major human resource crisis. But Fidel’s charisma and his audacious defiance of the US won the sympathy of radical professionals in Latin America, Europe and even the US. Thousands of professionals from other countries flocked to Cuba where they saw the prospect of building the kind of socialist society they could only fantasize about in their homelands. The UN Economic Commission for Latin America (ECLA) was packed with Leftwing economists. When Cuba turned Left, ECLA became the think tank of the Cuban government. Dozens of ECLA economists, all sympathetic to the revolution, helped run the National Bank, the ministries of foreign trade, industry, and economic development as well as the Central Planning Board. While their services were crucial in the first few years, Fidel realized that his country could not forever rely on expatriates. Cuba’s educational system must produce a new generation of Left intellectuals. Could this be implemented in a nation with 60 percent illiteracy? Addressing the UN General Assembly in 1960, Fidel announced his plan to abolish illiteracy in Cuba in one year. Skeptics thought he was daydreaming; yet Cuba actually achieved this in the most unorthodox fashion. Fidel declared 1961 “the year of education.” Paradoxically, he closed all schools that year. The students were sent out to teach the illiterate peasants how to read and write. Wearing uniforms like the guerrillas of Sierra Maestra, they went to countryside armed with flashlights and instructional materials. Castro hailed them as the new revolutionaries and defined their mission as the conquest of illiteracy. Since all Cubans speak Spanish, a phonetic language, the task of teaching how to read and write was not as difficult as the mission of the Thomasites who had to teach the Filipinos to read and write in a foreign tongue. In one year, Cuba’s illiteracy rate dropped from 60 to 20 percent. That, of course, was not functional literacy. Getting them to actually read and write was the bigger challenge. For this purpose the Cuban government subsidized the massive production of cheap reading materials. When the foreign authors protested the violation of copyright laws by publishing translations of their works without royalties, Fidel countered by saying that intellectual products are the common property of humankind and the authors should feel honored that they are widely read in Cuba. The hitherto illiterate peasants could now go to school. In the 1960s and 1970s it was not uncommon for 40• and 50–year–old peasants attending high schools and universities with their children. Many of these late bloomers actually became professionals with college degrees. The literacy campaign was also a way of raising the revolutionary consciousness of the youth. Two Cuban ambassadors to Manila — Ana Maria Gonzalez and Ramon Alonzo Medina — derived their revolutionary education from that experience. Besides education, Cuban socialism scored an outstanding achievement in the field of medicine. To the UN World Health Organization, Cuba’s health care delivery system is worthy of emulation. (This is one of the models for the UP School of Health Sciences in Palo, Leyte.) It was a brainchild of Che Guevara, himself a medical doctor before becoming a guerrilla. The core of this system is the community health clinic. As Che Guevara put it, the community clinic is the palace of health, while the hospital is a pre-departure area. Medical education emphasized prevention rather than the cure of diseases. The medical curricula were oriented to public health, not the training of specialists in such fancy, and remunerative areas as surgery, cardiology, neurology, oncology, etc. Each community now has a community clinic with at least one doctor and two nurses. Unlike our doctors who wait in their clinics for patients to go to them, the Cuban doctors regularly visit the 500 families assigned to their clinics and keep records of their medical histories. The Cuban doctors are not only medical practitioners, they also function as community organizers, so they play a crucial role in mobilizing people against imperialism. The acute shortage of doctors in the early 1960s was solved decades ago. In fact, Cuba has an oversupply of doctors. The medical schools that sprouted all over the island now produce several more doctors than those who fled to the US. Cuban doctors are highly prized in the African and Latin American countries because they are willing to serve in the most destitute areas. Besides diagnosing and treating diseases, they also teach and organize the local people to maintain a healthy environment. Unlike the Fil-Am doctors who go to the barrios for a few days in well publicized medical missions, the Cuban doctors live in the poorest communities for as long as three years. By the time their tour of duty ends, they leave behind proficient paramedics and well-organized communities. Of course, they also leave behind a lot of goodwill for Cuba. As already mentioned, Brezhnev was extremely generous to Cuba. Under him the Soviet Union supplied Cuba all the oil it needed, at preferential prices. It also supplied much of its food, medicine and other commodities. It bought all of Cuba’s surplus sugar. With Soviet aid and long-term, low-interest loans, Cuba survived the American embargo for over a decade. But dependence on another’s generosity is fraught with danger. Whereas in the early years of revolution Cuba represented an alternative model for socialism (non-bureaucratic and free wheeling), after 1968 Cuba restructured itself after the grim and officious Soviet mould, thereby alienating the non-communist radicals who once regarded Cuba with much enthusiasm and hope. In those early years Cuba was distinguished for innovation and improvisation as it pursued Che Guevara’s ideal of humanistic socialism. All this momentarily faded as Castro got enamored with the Soviet methods of economic management. He regained the spirit of critical thinking as he watched the Soviet economy flounder. In 1986 he launched a rectification drive to reverse what he called “errors and negative tendencies.” This led to the gradual but orderly dismantling of the Soviet model. Once again there was an outburst of originality in Cuban society. Che Guevara advocated diversification, but the Soviet economic advisers, working on the bourgeois theory of comparative advantage, urged the Cubans to specialize in the production of sugar and cigars. In the rectification campaign, however, Castro promoted the cultivation of food crops for the local market. Cuba continued producing sugar and tobacco, but there was a fervent search for alternative uses of these products. Castro also gathered the best Cuban biologists and bio-technologists in one research institute and provided them with world–class laboratories to develop new products out of sugar and tobacco, products that could compete in the world market. As a result, Cuba discovered the first and still the best vaccine for hepatitis B. This and other bio-technology products are now the third biggest dollar earners for Cuba. But these reforms came a bit too late. At the end of the 1980s and the beginning of the 1990s, the Cuban economy staggered with the rapid disintegration of the COMECON (the East European common market) and the collapse of the Soviet Union. All of a sudden it was deprived of $4 billion annual subsidy. The economy contracted by 35 percent. Without the Soviet Union’s protective umbrella, it became utterly vulnerable to military attack. All this prompted the US to go on the offensive. In 1992 it passed the Torrecilli Act to further tighten the embargo. Airlines and commercial vessels that landed in Cuba were banned from US ports. Foreign companies and foreign subsidiaries of US firms that traded with Cuba were threatened with retaliatory action. The CIA intensified its subversive activities in Cuba through NGOs that purported to champion human rights and press freedom. Fidel’s legendary charisma was put to a severe test as he appealed to orgullo nacional, the national pride of the Cuban people. Food rationing was imposed to prevent an outbreak of hunger. Public transport nearly ground to a halt as motor vehicles ran out of fuel and spare parts. Farmers used ox-driven carts to bring foodstuff to the market. It was indeed a terrible situation. Castro called this the special period, stressing its temporary nature. Meanwhile, Cuba made some concessions to capitalism. Small” and medium”scale enterprises were allowed to resume. (Perhaps it was wrong to nationalize them in the first place.) But Castro made it clear that socialism would never be abandoned, and education and public health would never be sacrificed. Foreign investors were invited, but only if they entered into joint ventures with the Cuban government. Liberalization was tempered by strict regulation. Ignoring the Torrecilli Act, private capital from Europe, Canada, Japan, and even Israel (whose UN delegation has consistently voted for the American embargo) started trickling in, attracted by the abundance of a well-educated labor force. American tourists defied the travel ban. By 1995 Cuba began to recover. To this day the economy remains abnormal, but nobody is starving; and life is much better for the Cuban people than it is for half of the 87 million Filipinos who fall below the poverty line. They remain steadfast in their support for the revolution. A CIA document leaked a few years ago advised President Clinton to desist from pressing for elections in Cuba because Castro might agree and he is sure of winning. His overwhelming victory in an election could be a great embarrassment for the US. No anti-Castro politician in Cuba or in exile can match his popularity. The CIA analyst also discouraged military intervention, arguing that it may be easy to conquer Cuba now that it has no Soviet support, but it is difficult to subdue a people in arms. America could not afford another Vietnam. The advise was for Clinton to wait for Castro to die a natural death; after all he is already old and ailing. Even if Castro dies, I am confident that socialism will survive in Cuba. The social changes in five decades of revolution cannot disappear overnight. As we have seen in Russia, Yeltsin’s capitalist restoration proved to be a total disaster. As the Russian people recoiled from the rising power of the Russian mafia, Alexander Putin quietly brought back the Soviet institutions, but without the communist label. Fidel has the good fortune of living long enough to preside over what Max Weber called “institutionalization of charisma.” His comrades in Sierra Maestra are fading from the scene, but Fidel had the foresight to rear a new generation of well educated and totally dedicated socialist leaders who are capable of carrying on. Today he does not appear in public as much as before. _________Editor’s note:This essay was delivered as a lecture at the UP Faculty Center Conference Hall on 26 July 2006.